Treat both indoor and outdoor residential or commercial areas with this ready-to-use insecticide which kills mosquitoes, spiders, ants, flies, moths, ticks, beetles, scorpions, and bedbugs. Extinct Insecticide can also be sprayed directly on cattle, chickens, and dogs to control flies and ticks. It is ideal for homes, kennels, processing plants, restaurants, warehouses, apartments, motels, hotels, office buildings, and schools. 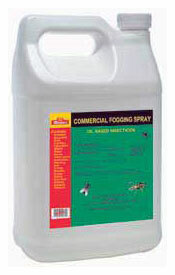 Include this item as part of a pest control program; use as either a mist spray or fogger. This product is designed to kill a wide range of insects for up to 4-weeks. It contains 0.50% Permethrin and care should be taken when handling. Personal Protective Equipment is required. Refer to product label for further instructions. Extinct Insecticide is a ready-to-use insecticide. It has been premixed in exacting proportions during manufacturing, so you never have to measure or mix, or risk using a solution that's too strong to be safe or too weak to be effective. Ready-to-use products allow you to use the exact amount you need, thereby minimizing waste.